First off, to answer the first question, doing things like coaching my kids’ teams is really important to me and since basketball is a sport I played competitively when I was younger, I thought it would be fun. Boy was I RIGHT! It was an absolute blast! Maybe I’m inspired by March Madness, but aside from the pure joy of helping them learn the games they love, I realized there were lessons in it for me as well. Lessons and reminders perfectly applicable to the association world. Like little kids, new members need to know the basics. After the fourth week of basketball (out of six), my son said, “Daddy, I almost got the ball up to the ring.” Of course, he meant “rim” and at that point, I realized I hadn’t done a great job of helping the kids with the basics when we first started. I was so worried about helping them have fun and learn about passing, shooting, and dribbling that I forgot to teach them the real basics - you know, things like what the equipment is actually called. Rookie coaching mistake. Lots of times, new members need some coaching about the basics of the association and what they can utilize/take advantage of, just like new basketball players. How many of our fellow associations still simply send a folder of materials hoping new members read it all, and call that their onboarding program? Instead, what if we took time to bring them up to speed on the basics? How about a video series, an intro call from a staff member, or something that actually coaches the new member about things they need to know, based on what they’re looking to get out of the association? A well-informed (or coached up) new member is an engaged and retained member. This is great news for your association. In the same way, only a small percentage of our members will ever become volunteers. An even smaller number will serve on the board of directors. As staff, we often think the ideal way for members to show their engagement and satisfaction with their membership experience is by serving the association. But that’s not the reality, and many members are completely satisfied and engaged in their own way, perhaps by getting the magazine and publications, or by attending a networking reception in their local city (where they may have even been whispering about Pokèmon.) We need to understand and embrace the uniqueness of each member’s ideal experience and not assume that because someone isn’t a volunteer, they aren’t satisfied with their membership or interested in the organization’s work and success. Kindergarten basketball is a place for development, just like associations. On our team, we had a wide range of abilities. One kid was the best in the whole league, while my son and his buddy were more interested in their “discussions” than playing a lot of basketball. Even with their differences, during practice it was clear that each of the kids was eager to get better. And by the end of the season, I can honestly say that they all had improved and developed their skills, thus being more prepared to play again should they want to in the future. 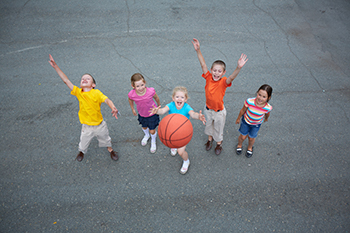 Kindergarten basketball players are similar to members in that way – they want a place where they can develop their skills. In many instances, young members specifically want to develop leadership skills so they can be more effective and marketable in their careers. An association provides a perfect opportunity for them to do just that. In fact, in my own organization, the American Society of Pediatric Hematology/Oncology, we are working on a leadership development plan to ensure a growing number of opportunities since we know that’s what our young members crave. I’m a big fan of utilizing real world experiences to inform my blog posts, and I firmly believe that in just about every situation, lessons that relate to our work are there for the taking. In one sense, you might say comparing kindergartners to members is crazy. However, you might also think (like I do) that with a creative and inquisitive point of view, there’s much to learn by watching kids and the way they do things. The one thing I still haven’t learned by watching them though… Pokèmon.